Success and failure can be pleasingly distinct. Other times, it’s a matter of definition and perspective. That’s how it tends to be with education, even though the debate about how our schools and students are performing tends to be as muddy as any wintry slog on a sportsfield. But this is not a sporting contest. For one thing, the rules tend to be in constant dispute, the sidelines hazy, the pitch uneven and (small point) everybody’s meant to be on the same side. A couple of attempts to help calibrate our views on educational performance have been made in recent days. 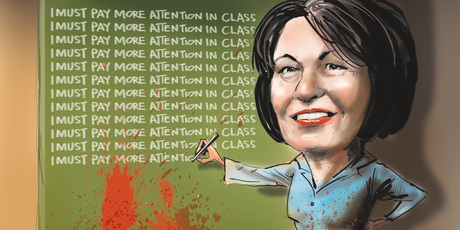 Education Minister Hekia Parata found herself able to point to improved NCEA success rates for secondary school pupils. She was not making it up. It’s no small thing that 77.2 per cent of 18-year-olds achieved NCEA level 2 last year. That’s up 2.9 per cent on the year before and represents a fair rate of improvement that, if it becomes a trajectory, would nicely surpass the target of 85 per cent set for 2017. It’s one good sign, though Ms Parata isn’t so naive as to let her quote about the “great result” reach a fullstop without adding the requisite “we must continue to do better”. At the same time, the Post Primary Teachers’ Association has released research to persuade us to reassess, and discard, one of the rallying cries of our educational critics that “one in five New Zealand pupils is failing in education”. Using the Education Ministry’s (2009, mind you) OECD Programme for International Student Assessment (Pisa) database, the researchers conclude the claim is simplistic and ignores complex issues. Those other factors matter, the report’s authors contend, because the misleadingly narrow message that there is a crisis in schooling is being used to drive through radical policies. The Government’s practice of separating out a single factor failed to recognise many of the factors that contributed to underachievement. Ms Parata defends the one-in-five estimate as a reflection of research on school leaver qualifications, particularly that up to one in five young people leaves school without the skills needed for modern jobs. Sorry, “up to”? As many a disappointed shopper exiting a hyped-up store sale can attest, “up to” can represent a maximum that scarcely gives a helpful overview of what’s really on offer.